Arthritis is a condition that is commonly associated with swelling and inflammation of the joints. Arthritis can affect anybody regardless of their age; and it makes it difficult to use the joints, making movement restricted. There are foods which increase the joint inflammation and as well as the joints pain. to know the right diet treatment can helps you to deal with arthritis more easily. There are so many causes of arthritis. However, the most common cause of arthritis is an infection. The immune system fights harmful bacteria and fungus in the body naturally. If the immune system of an individual is in disorder, it releases too many defensive agents that do not only fight the harmful bacteria but also the useful ones, as well as your joints. The other causes of arthritis include disease of the nervous system, metabolic disorders, hypothermia, trauma and environmental conditions. Why arthritis diet is so important? While there are a lot of treatments for arthritis, food plays a major role in treating or joint inflammation generally. On the food front, there are foods that can help to fight the pain and increase movement, while there are other foods that make the pain worse. Foods such as ginger, garlic and turmeric can contribute to fighting the arthritis pains. If you are suffering from arthritis, the purpose of this article is to list out ten foods that you should be looking to avoid. This article is not meant to give medical advice, but to provide information based on research and testimonies from people with arthritis. Read and enjoy! This arthritis diet article contains foods to avoid which will help you to know more about arthritis diet treatment. After reading this article I recommend you to read also about 10 foods which help for arthritis. If you are suffering from arthritis, you should avoid eating large quantities of red meat. One of the reasons to avoid red meat and processed meat is that it contains high levels of an omega-6 acid called arachidonic acid, which may worsen the pain and inflammation. Red meat also contains chemicals like, nitrites and purines which can also cause joint pain and inflammation. The high content of protein casein in dairy products can also contribute to arthritis. Protein casein in dairy products can also trigger pain and inflammation of joints. In addition to this, fat tissues found in dairy products such as milk, cheese, and butter can trigger adipose inflammation, which in turn leads to increased joint pains. Pasteurized dairy should be avoided if you suffer from arthritis or any pain. So do your best to leave the dairy products out from you arthritis diet. High levels of sugar intake can increase the glycation end products in the body that causes inflammation. The high calories in sugar can cause weight gain from an excess intake, which in turn puts more pressure on the joints and increases pain. Sugar-sweetened beverages like soft drinks, fruit drinks, and pre-sweetened cereals should be avoided. Pastries, candy and snacks that are high in sugar should also be avoided. Natural sweeteners such as honey, stevia and blackstrap molasses should be used in place of artificial sweeteners. Regularly eating eggs can lead to increase joint pain and inflammation. The egg yolk contains arachidonic acid which can increase inflammation in the body. Egg has saturated fat that contributes to swelling and pains. It is better to eat the egg white in omelet form. Avoid eating the yolk. Not only is fried food not good for your heart, but it is also not good for your joints. You get omega-6 oils from eating fried foods. Although omega-6 is good for the overall health of the body, excess intake can lead to secretion of enzymes in the body which causes inflammation. I am not saying you should stop eating fried foods. However, you should try to limit the intake of fried foods for the reasons given. If you are reading this, it is likely that you take a little bit of salt to bring out the flavor in your meals and give your meals the needed taste. However, salt can cause fluid retention and joint swelling. Table salt or refined salt has additives and chemicals to make it non-flowing, but these chemicals can cause a fluid imbalance in your body. Natural minerals such as silicon and phosphorus- that the body needs to function properly are not contained in table salt. You can reduce the risk of osteoporosis and fractures by limiting the intake of table salt (which lowers the loss of calcium in the bones). Excessive intake of alcohol can lead to some health conditions, including arthritis. Alcohol has high purine content which the converts to uric acid. Uric acid is known to cause joint inflammation. If you are already suffering from arthritis, it is best to avoid consuming alcohol. To avoid swelling and joint pains, you should avoid intake of beer and other alcoholic beverages. Snacks and baked foods contain corn oil which is high in omega-6 fatty acids. These omega-6 fatty acids can trigger inflammation of the joints. Also rich in omega-6 fatty acids are Safflower, sunflower, soy, peanut oils, and grape seeds, many salad dressings, and mayonnaise. You don’t have to remove them from your arthritis diet entirely. However, you must moderate your intake to ensure it doesn’t become excessive. Refined flour and grains can also cause swellings, which can lead to arthritis. They are high glycemic index foods. These foods produce advanced glycation end products that spur inflammation. Grains lack vitamin B and fiber and have no calories. The risk of degenerative diseases such as coronary heart disease, cancer and diabetes is increased from regular consumption of grains. The casein and gluten found in whey protein products can also cause inflammation and pain. Casein is responsible for the production of uric acid in the body, and excessive uric acid in the body may lead to inflammation and pain in the body, including the joints. The joint pain caused by uric acid is also known as gout. This pain may be severe and do lasting damage to the joints. Thanks to Admin for sharing the above home remedies for Joint Pain. I am a 62 yrs old man. Getting joint pain at night. Generally to avoid pain I am consuming pain clear tablets. But it has side effects. That’s why I am looking for natural ways to get rid of Joint pain. Recently I had a discussion with one of my friend, he suggested me this link. Refer to him these remedies are very effective. Keep sharing such articles related to health and health care. Good Job! Subscribe and receive our special eBook for FREE! 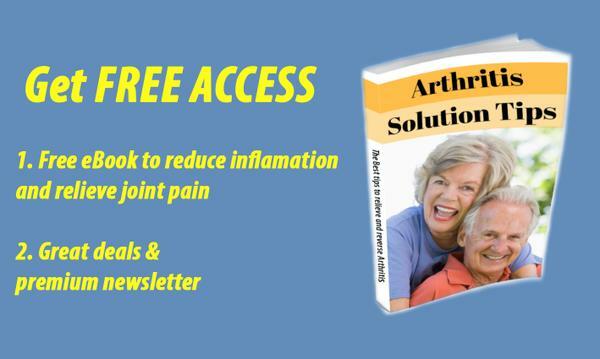 , fill your details and get unique information & tips to treat arthritis and special promotions and exclusive offers.